effective ways to successfully pass knowledge from one generation to the next. When this method is not practiced, knowledge transfer can be ineffective and self-sabotage may unknowingly be passed on. The most effective knowledge transfer may be counterintuitive for most. And it is likely uncomfortable for people who are very accomplished and/or have the kind of intelligence that could be valuable for subsequent generations. Therefore, it is rarely practiced. Why? It requires an immense amount of listening. In our educational system, you are rewarded for giving the right answers. And you expect the teacher to “tell” you the answer when you don’t know it. When you combine that with the fact many smart people demonstrate their smartness by “telling” how much they know, you have an environment that is not very conducive for listening. And the person receiving the knowledge will want you to “just tell” them the answer. The person with the knowledge is proud to accommodate you. On the other hand, transferring with the intent to listen creates a more effective paradigm. Why? If the wise person becomes Socrates, he or she will ask questions first. That way they will understand the state of mind of the other person. They will also gain insight into what the listener already knows. That will allow them to avoid “telling” the other person information they already have. Furthermore, by listening, you learn to speak the other person’s language. And you will be able to make the transference of knowledge relevant in a context they can relate to. Otherwise, your knowledge may appear irrelevant, even if it’s not. The listener simply has to hear it in a way it relates to their world. That only happens if you ask questions and listen first. 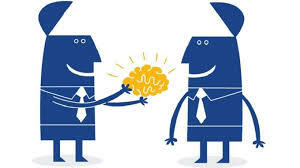 In addition, it would be significantly more effective if your knowledge transfer occurs through the inquiry. As you ask questions, instead of telling the person the knowledge, your questions allow them to discover the answers for themselves. Through that approach, you become a guide. And you demonstrate your wisdom by knowing what questions to ask. Also, it helps you to become more objective. It will allow you to catch when you and the other person are engaged in unintentional self-sabotage. When you see it,you can address it. To sum it up, knowledge transfer is critical. It helps our societies avoid a repeat of history. There are many discoveries that took place 100 years ago or more. Yet, in the 21st Century, people are learning the same thing as though it is new. At some point, the knowledge was lost. Not only does society incur the unnecessary cost to rediscover, some of the challenges faced may have been eliminated. If parents, leaders, scientists and others make a concerted effort to engage in effective knowledge transfer, we may be able to put an end to history repeating itself. As a result, there may be completely new horizons available to mankind. Except, if we continue with the current paradigm we will never move into those new possibilities. How will you engage the next generation? 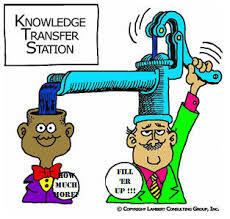 There are different kinds of knowledge you can transfer. Cultural knowledge that people should know but rarely use unless on informal way. Technical knowledge that are a collection of intellectual tools you will regularly use. Soft knowledge such as psychology, choice making etc.. All these different knowledge has, I guess, its own preferred way of transfering to a young generation. I'm active listening-learning from 'reverse mentors' who are incredibly gifted and talented yet much younger than I. I find there is so much to learn from others no matter the stage and age.